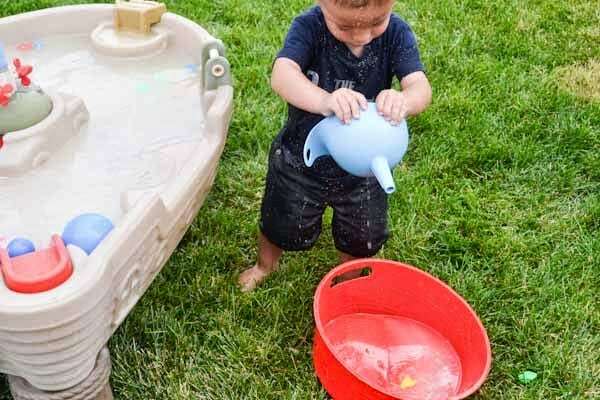 Today we have a ton of water play activities to share with you so grab a towel and join in the fun! 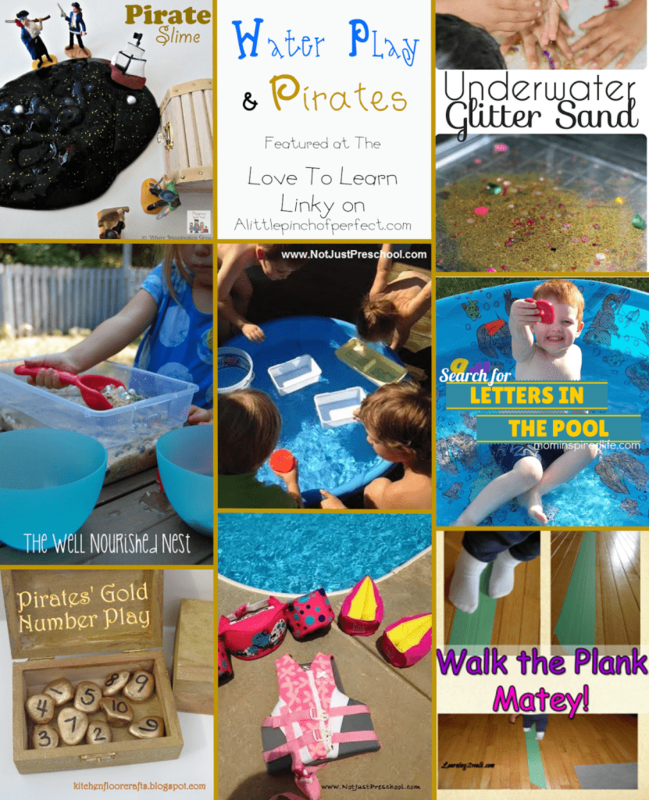 First up, we are presenting ABC Soup, then we are sharing 8 more awesome water play and pirate activities that we love! My kiddos loved playing ABC Soup. We filled up our pirate boat water table, added some letters and started playing. I think our water looks like broth because I dumped in corn meal left over from our Edible Sand Sensory Play activity. Let’s start playing! Don’t forget water safety-never leave kids unattended! 1. Fill container with water, add letters, give kiddos scoops and spoons, and let them catch letters. I let the kids play and explore the activity without making a point to mention the letters. I was thrilled when Ms. Tiger naturally started naming the letters she knew, then asking the names of the letters she didn’t recognize. What a great stress free way to learn! Mr. Tickles picked up letters using his hands and tried out all the water toys we had out helping to improve his fine motor skills. I love it when we do learning activities that both of my kids can enjoy despite their different stages in life. Everyone wants to hold the hose…when water is involved, my kiddos are always happy! Dumping letters in his soup bowl, picking them out and putting them back in the boat, and doing it all over again. We love our new scissor handled scoops. They work perfect for water activities because they have holes that let the water drain out. Ms. Tiger caught letters with her scoop and dropped them in her soup bowl. Now it’s time for the Love to Learn Linky! Thank you to everyone who shared last week. I really appreciate each one of you for participating and I LOVE seeing your wonderful ideas!If you were featured, be sure to grab a button! What a lovely collection of fun water activities! I especially like the alphabet soup! What a great post. I am pinning this and it will be featured on Meaningful Mama. Thanks so much for linking up with Mom's Library. I hope we see you again this week! Looks like a great way to practice ABC's! Featured you on Mom's Library this week! Hi Ashley, thanks so much for stopping by and sharing the great news! I really appreciate the feature and am excited to see it! Have a fun day! Somehow I missed this! Thank you so much for featuring our Letters in the Pool post! Hi Danielle, you are welcome and thanks for sharing with us each week. Hi Amanda, It's nice of you to visit 🙂 Thanks so much for the feature, I look forward to next weeks party. This is such a fun idea! My kids would have a blast doing this!